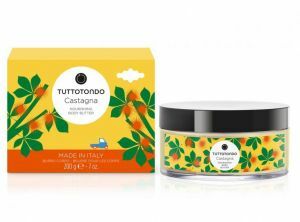 Full-bodied cream made from shea butter and beeswax, with intense moisturizing and nourishing properties. It is enriched with chestnut extract, wheat germ oil and ceramide 3, which give nourishment, elasticity and tone to the skin releasing a delicate and intense fragrance. The formulation does not contain parabens, mineral oils, or dyes. The chestnut is known for its extraordinary nutrients. Rich in starchy substances, minerals and vitamins, the chestnut is an excellent remedy tonic for the skin and therefore particularly suitable for very dry and sensitive skin.